Lifestyle photography, identity design, web design, and copywriting for a bear canister manufacturer focused on best practices for the conservation of bear populations. LIGHTER1 had been manufacturing and selling their bear canisters for close to a decade when they reached out to Westpine for a complete overhaul of their creative assets. 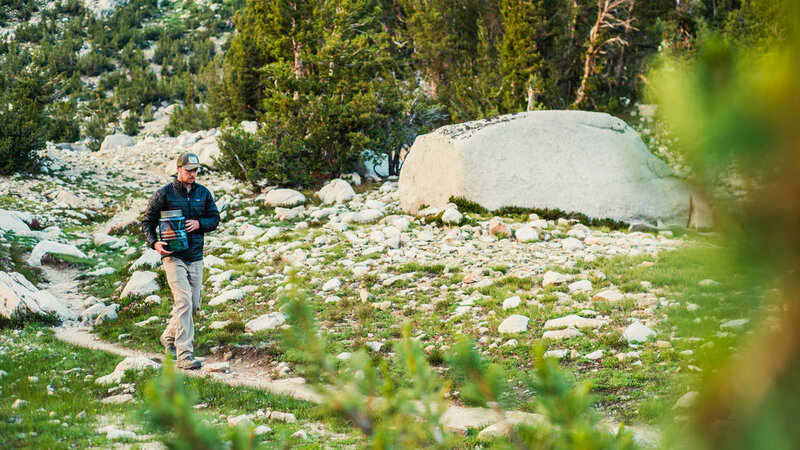 We started by producing and shooting a backpacking photoshoot backcountry location in California's Eastern Sierra. After an initial round of research on suitable locations, a number of backcountry routes were presented to the client, and logistics led us to shooting in the the Kearsarge Lakes. With the trail climbing to over 11,700 feet, talent was chosen both based on client demographic specifications and the ability to backpack the required distance and elevation. Shoot production spanned over two days, with one night spent in the backcountry. Images were shot with their website end use in mind, whether they were composed for use as wide aspect ratio hero banners or for normal aspect ratio lifestyle vignettes intended to accompany product photos. Occasionally brands find themselves in a position where their identity design is in need of an update but for one reason or another the new design concept needs to maintain continuity with the legacy branding. Drastically altering the LIGHTER1 wordmark would have required a retooling of their canister molds, a lengthy and capital-intensive process, so we took the all-caps oblique motif but incorporated a typeface with more modern leanings as well as a graphical bear canister element around the number one in the wordmark. To finish it off, we intentionally spaced the "Bear Canisters" sub-heading below the word "light" in LIGHTER1 to subliminally reinforce the lightweight advantage of LIGHTER1's bear canister system. The lifestyle photography production and refreshed identity design culminated in a completely remade website for LIGHTER1, featuring full-width banner images from our lifestyle shoot, a memorable catchphrase/headline for the brand, body copy throughout the site in a consistent brand voice, a diagonal design motif drawn from the wordmark styling, and intentional call-to-actions throughout the website pointing visitors toward purchasing products. Additionally, we channeled the LIGHTER1 staff's passion for bear conservation into a page on best practices for backpacking in bear country. On the backend, we set up domain-specific email addresses for the client on Google's robust G Suite platform and implemented our refreshed logo and wordmark into their avatars and email signatures for a cohesive brand experience across all customer points of contact.